When I started writing this commentary, I looked out of my window and decided a good way to start would be to mention that here in the Netherlands winter had finally arrived. Snow had fallen and ice was beginning to be visible on the pond in the park. However, by the time I was finishing writing this a few days later, the situation had already changed and the temperature was again above zero degrees Celsius. 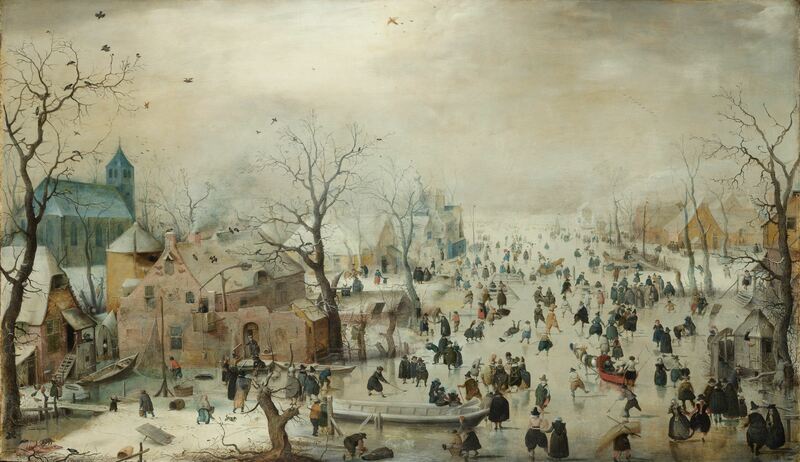 Hence, instead of referring to the current weather, I’ll use an old Dutch work of art (Fig.1). It was painted in a time of severe winters and illustrates the impact of winter on the landscape and on human behaviour. Winter also influences plants, and flowering is a prime example of a trait under control of environmental cues such as light and temperature. Temperature influences flowering both via small fluctuations in ambient temperature and via longer periods of winter cold. In the latter case, the promotion of flowering in response to a prolonged exposure to cold is called vernalization. In the model plant Arabidopsis thaliana, a lot is known about regulation of this process. In particular, the transcription factor FLC is known to be a central player in the vernalization response. FLC is a repressor of flowering which has to be repressed itself in order to allow vernalization. In a recent paper, Helliwell et al. (2015) propose a hypothesis on how the influence of winter cold on flowering is initiated. Increasingly, there is a role for computational approaches in understanding the regulation of flowering time, including vernalization (Angel et al. 2011). As recently described in a review on gene regulatory networks involved in Arabidopsis reproduction (Pajoro et al. 2014), computational models come in a variety of flavours. Examples include two models for the Arabidopsis flowering time integration network (Valentim et al. 2015), which integrate computational modelling with experimental data in order to understand the function of a gene regulatory network. Helliwell et al. (2015) made a different use of models. Here, the main purpose is to generate hypotheses which then still await experimental validation. Their hypothesis deals with the question of how repression of FLC is initiated. As mentioned above, FLC is the main player in Arabidopsis’ response to vernalization. Although a lot is known about FLC repression, it still seems unclear what is the very first step in this repression. Their central proposal is that the initial response to temperature change is physical, in the sense that there would be reorganization of the folding or looping of the chromatin polymer which would derive from a polymer entropy effect. Such a physical response is quite a general effect, different from a response enabled by a particular gene or protein, which changes its behaviour upon temperature change. To clarify the idea of a physical response, you could look again at the scene visualized in Fig.1. Ice is clearly visible, and this is the result of the physical response of freezing. 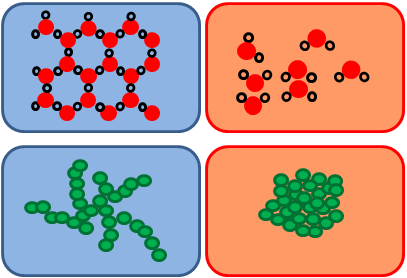 In this process, molecules themselves do not change, but their configuration change with respect to each other (Figure 2). Fig.2. Physical responses to temperature change. (Top) Water changes structure upon the transition from liquid water (right) to ice (left). Red indicates oxygen atom, black hydrogen atom. (Bottom) Polymer phase transition from high temperature (right) to low temperature (left). Green circles indicate monomeric subunits of polymer. models. These are described from a mathematical perspective as well as more visually by a video recording of the relaxation of a rubber band. One aspect of this hypothesis, which I think is beautiful, is how it connects different ‘levels’. This is actually an important aspect of computational models: on which scale or level do they operate? Models can, for instance, describe a whole plant, they can be tissue-based, or at the other extreme, models can be molecule-based such as the above-mentioned gene regulatory network models. Modelling chromatin via polymer physics models involves molecules but is clearly at a higher level than the scale of individual proteins or genes. In fact, the exact nature of the DNA and proteins involved in chromatin is not considered. These components are aggregated simply as ‘polymer’. The polymer scale is then connected to the molecular and cellular scale via its proposed influence on FLC expression and finally to the macroscopic level as it would influence flowering time upon vernalization. What still puzzles me is how such a physical response could specifically influence FLC and not a lot of genes all over the genome. What would be special about FLC related chromatin? Helliwell et al. (2015) mentioned that ‘it is likely that the combination of DNA sequence and chromatin topology of the FLC locus make this locus uniquely responsive to changes in temperature’, but to me it is not clear how that could be accomplished for such a general physical response. Of course, any type of hypothesis or model should ultimately be tested with experiments. They also discussed a few examples of how analysis of kinetics of gene expression would enable this testing to be done. This would involve analysis of the kinetics of FLC repression after transfer to different low temperatures, and the kinetics of repression of genes neighbouring FLC. It will be interesting to see how data obtained in this way will validate or falsify the hypothesis on the importance of the physical response of chromatin to temperature for vernalization. From my perspective here in the Netherlands, it is very timely to read Helliwell et al. (2015) paper. Even if we are not aware of it, plants around us are already preparing for the time after winter. The question what is the initial kick-start by which cold enables this response is clearly of fundamental importance to understand the regulation of flowering– and this paper generates fresh ideas on this issue. Helliwell CA, Anderssen RS, Robertson M, Finnegan EJ. 2015. How is FLC repression initiated by cold? Trends in Plant Sciences. 20(2) 76-82. Angel A, Song J, Dean C, Howard M. 2011. A Polycomb-based switch underlying quantitative epigenetic memory. Nature 476(7358):105-108. Pajoro A, Biewers S, Dougali E et al. 2014. The (r)evolution of gene regulatory networks controlling Arabidopsis plant reproduction: a two-decade history. Journal of Experimental Botany. 65, 4731-4745. Valentim FL, van Mourik S, Posé D, Kim MC, Schmid M, van Ham RCHJ, Busscher M, Sanchez-Perez GF, Molenaar J, Angenent GC, Immink RGH, van Dijk ADJ. 2015. A quantitative and dynamic model of the Arabidopsis flowering time gene regulatory network. PLoS ONE 10(2):e0116973. This entry was posted in flowering, Uncategorized and tagged Aalt-Jan van Dijk, chromatin, cold, FLC, FLC repression, flowering regulation, vernalization. Bookmark the permalink.